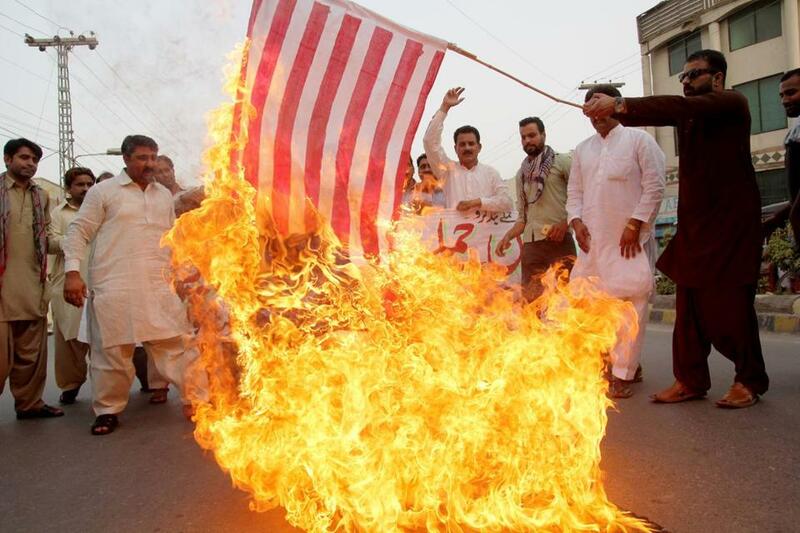 A Pakistani demonstrator holds a burning US flag as others shout slogans during a protest in Multan on May 24, 2016, against a US drone strike in Pakistan&apos;s southwestern province Balochistan. Every country has interests. They may be as many and varied as our geopolitical imagination can conceive. Within each list of interests, however, is a far smaller and more important list: the vital interests. Those are interests that countries believe they must defend in order to assure their survival. Wars are fought to defend vital interests. For that reason, countries should have as few of them as possible. Today the United States considers too many of its interests vital. Shedding some of them would be a concession to logic and the passage of time. When we see existential threats everywhere, we are tempted to plunge into operations that may resolve short-term problems but ultimately weaken our own security. The fewer vital interests any country has, the safer it is. During the Cold War, America’s list of vital interests was staggeringly long. Our leaders believed the United States would be in grave danger if Iran nationalized its oil industry, Guatemala pursued land reform, Communists controlled Vietnam, or Chile elected a Marxist president. We fell into the bad habit of seeing all our interests as vital. Our future success in the world depends on breaking this habit. Having a long list of vital interests requires readiness to intervene with coercive power, including military power, in much of the world. That is costly. Often it exacerbates the local conflicts it seeks to resolve, and ends up undermining rather than advancing our interests. During the Cold War, American leaders asserted that our power had to be global because we faced an enemy with global ambition. Today we do not. Like any prudent nation — or person — we must rank our interests. Not everything that is important or desirable is also vital. It is in the US interest that Afghan girls be allowed to study, gay rights be respected in Uganda, and free press be restored in Turkey. We would benefit from an end to civil wars in the Middle East, repression in Cuba, terror in East Africa, and gang violence in Central America. Americans would feel better in a world where brutal leaders did not periodically terrorize their people. None of these goals, however, rises to the level of a vital US interest. Our impulse to intervene because bad people are doing bad things has not served us well. In many cases, it has not even helped the victims we claimed to be defending. It is in our vital interest to assure that the United States is never attacked with weapons of mass destruction; that wars on other continents not spread onto our territory; that we maintain global trade routes on which our prosperity depends; that no hegemonic power on another continent becomes so strong that it threatens us in the Western Hemisphere; and that climate change does not disrupt our national life. To those vital interests I would add just one more: looking good to others. One of America’s great strengths is the soft power of our example. Not many people in the world consider China, Russia, or Saudi Arabia to be inspiring models. Great numbers admire the United States. This pro-American sentiment is an enormous strategic asset for us. It fades when we allow our political system to degenerate and our society to become more unjust. These failures do not simply weaken us at home. They also erode a pillar of our global standing. That makes resolving our domestic crises a vital interest of our foreign policy. Listing vital interests is easy. What about the longer list — the list of our interests that are not truly vital, and that we should subordinate to others? For which of our many interests should we not fight? Which threats have we inflated beyond reality? These are some of the interests the United States should stop considering vital: maintaining military dominance in Europe; limiting Russia’s influence over nearby countries; controlling the Persian Gulf; protecting regimes in the Middle East; containing Iran; assuring Israel’s dominance over the Palestinians; shaping Iraq and Afghanistan; defending Southeast Asia against China; winning military dominance of outer space; implanting democracy; and preventing oppression. Taking those off our list of vital interests would liberate us from the impulse to choose sides in every conflict. Restraint usually advances our interests more reliably than intervention. Farsighted nations define their vital interests narrowly. That makes them cautious rather than compulsively active. By behaving as if we have vital interests everywhere in the world — by intervening aggressively in Eastern Europe, the Middle East, Asia, and beyond — the United States squanders its strategic power. When we lash out, it should be only to defend our truly vital interests.